The time we have all been waiting for is here! It’s time to start getting ready for this year’s CF Summit. Hosted by Adobe, this year’s event will be in sunny Las Vegas, Nevada. 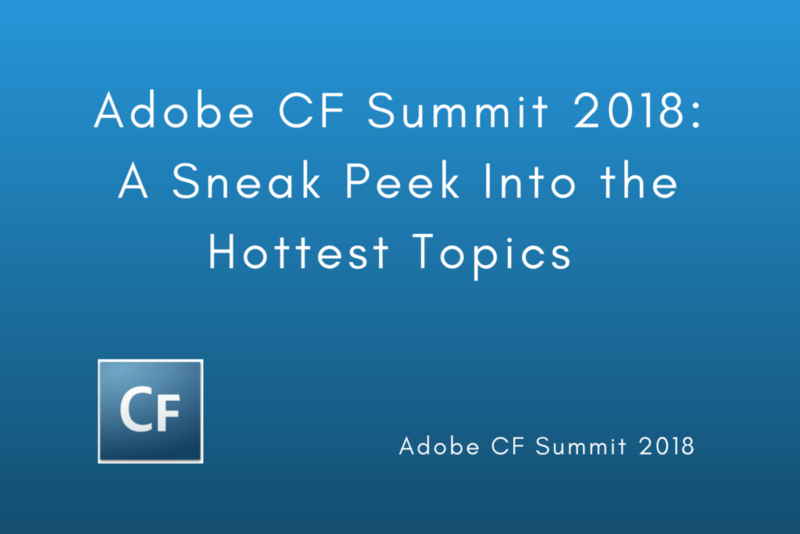 The CF Summit is the best place to be for the hottest new updates and information for all CF’ers– beginners and experts alike. Here you can work on your networking skills and reach out to other developers in the CF community. There will be many speakers speaking on a wide range of topics. Amazon Alexa is just one of the latest components of the new voice-activated wave of technology. Named after the ancient library of Alexandria, Alexa is a voice control system employed by Amazon for use in its compatible speakers. What really sets Alexa apart is its ability for voice recognition and activation. There is no need to press any button. Just state, “Alexa…” followed by the command. So how does this apply to ColdFusion? 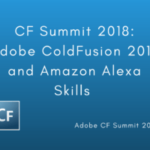 Adobe ColdFusion can be actually utilized to create and build “Skills” for the Amazon Alexa system. The Takeaway: After this session, CF Summit attendees will have a clearer understanding of consuming utterances, intents, and slots about Alexa. Learn how to create custom voice responses that you can use to interact with Alexa. Following the session, you will have gained everything you will need to start including a custom CF framework and template. 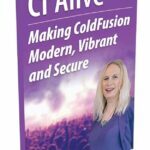 About the Speaker: Mike Callahan’s ColdFusion experience dates back to the Allaire days. A veteran in the field, he now works in biotech using ColdFusion to create RFID solutions. He is currently working with Thermo Fisher Scientific. This session at CF Summit 2018 will introduce newer users to unit testing, BDD, and Mocking using TestBox and MockBox. This session is great for new users or for veterans looking for a nice refresher course. Unit testing is a software testing method by which source code, computer program modules, usage procedures, and operating procedures are tested to determine whether they are fit to use. This is particularly important for those about to make their apps live. It also discusses BDD (Behavioral Driven Development) styles. BDD is popular and easily used for unit testing. Mocking allows you to unit test in a controlled way before making your application go live. The Takeaway: You will discover how to do unit testing and what is the importance of. It also presents guidelines to write the unit tests. xUnit and BDD styles of testing is covered for TestBox, Given-When-Then syntax, and structure for writing unit tests. There will be a Mocking demonstration using MockBox. This is a must-attend for those looking for more information on testing. About the Speaker: Uma Ghotikar has seven years of real-time experience working in technical fields. She is an expert in web app development, database design, and database development. The 3rd CF Summit session on our list is all about security with the ColdFusion security guru himself, Pete Freitag. As we all know, no system is 100% secure. That doesn’t mean that we should neglect our security concerns. We as developers should strive to reach maximum security concerns for all of our databases. This is particularly tricky when it comes to large, complex mature databases. The Takeaway: This session will provide you with some techniques and insight for finding vulnerabilities hidden within your code and app. This should allow you to improve your CFML security over time. About the Speaker: Pete Freitag is ColdFusion’s resident security guru. He has nearly 20 years of ColdFusion development experience. Co-founder of Foundeo.com, he has developed two top-notch CF security products in FuseGuard and Hackmycf.com. APIs are undoubtedly the core of both programming and ColdFusion. This is why it is so wonderful to have the Adobe API Manager. This awesome tool can definitely help you manage your APIs and move away from the previous close coupling of ColdFusion. 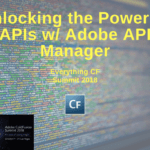 The Takeaway: This session will teach you on how to utilize all the hidden features of Adobe’s API Manager. You will also learn about the raw power of native APIs and how the API manager can help you handle them. As a bonus, you will also receive a custom Word Press plugin that helps integrate internal and external APIs with Adobe’s native APIs. About the Speaker: Brian Sappey is a ColdFusion supporter and API expert. He is currently advocating the use of APIs in the E-commerce infrastructure of Market America and SHOP.com. Docker, on the other hand, is paving the way with containerization. Containerization makes apps much more portable by allowing these apps to run on any machine without requiring their own VM. Along with portability, containerization is much less resource intensive. The Takeaway: At this CF Summit session you’ll get a comprehensive look at standardizing your server infrastructure. This can help you to simplify the number of servers you need and create a standard for your web apps. There will also be a brief intro into Docker and what containerization can do for you. Attendance is highly recommended for all. About the Speaker: Brad has been programming ColdFusion since 2001 and has used every version of CF since 4.5. He first fell in love with ColdFusion as a way to easily connect a database to his website for dynamic pages. He enjoys configuring and performance tuning high-availability Windows and Linux ColdFusion environments as well as SQL Server. Brad is the ColdBox Platform developer advocate at Ortus Solutions (https://www.ortussolutions.com/) and lead developer of the CommandBox CLI. A major decision that every CF developer faces is how to deploy their newly minted web apps. There are many different options. One of the most popular options is cloud hosting. Cloud hosting is like having a dedicated virtual house – one that you can instantly clone for more space when a horde of out of town guests arrive. Amazon offers cloud hosting through its Amazon Web Services (AWS). AWS offers pay-as-you-go pricing and includes a 12-month free tier to help you acclimate to the platform. The Takeaway: CF Summit 2018 attendee will learn the ins and outs of deploying your CF web apps to the Amazon Cloud. The primary focus will be on using Jenkins and the AWS Console. There will also be a discussion on how CF interfaces with Amazon services Lambda and S3. About the Speaker: Keen Haynes is a retired US Marine who worked with ColdFusion since 1998. He was previously part of the Allaire/Macromedia Consulting Service Team. 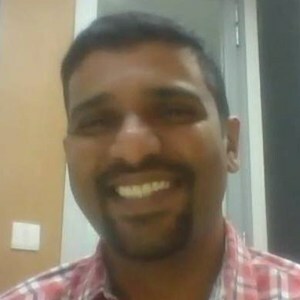 He currently works for Thermo Fisher Scientific as an AWS certified Senior Developer. For CF’ers new to functional or object-oriented programming, recognizing the benefits of these features can prove to be a real challenge. The Takeaway: This CF Summit session focuses on the new language enhancements in CFML. The focus here will be less on theory but more so on real-world application. All code demos performed during this session is about actual scenarios you may encounter during your stint with ColdFusion. You will learn more about closures and when to use them. You will learn more about the differences between the Elvis operator, ternary operator, and safe navigation operator and when to use them. There will be a topic on when it is appropriate to use CFQuery tags and QueryExecute. This session is for intermediate to veteran level CF’ers. Those attending should have a base knowledge of CFML and concepts such as arrays, queries, variable scoping, and anonymous functions. These are just a few of many great sessions to learn from at the 2018 CF Summit. 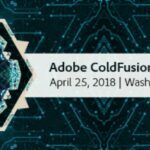 Be sure to get your ticket on time and receive a free copy of Adobe’s 2018 ColdFusion Builder! 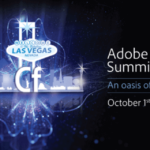 Adobe ColdFusion Summit 2018 Pre-Conference Shows- and It Looks Awesome!